I haven’t officially announced CityScape Battle yet, but I wanted to give you guys a sneak peak of the game I’ve been working furiously on the past several months. In the coming weeks I’ll officially kick off the CityScape Battle dev diary and post tons of info, pictures, and gameplay movies. For now I’ll “tease” you with this one screen shot. 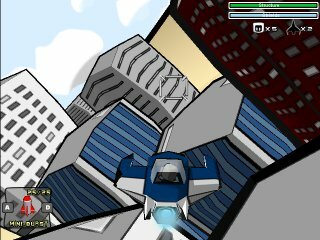 CityScape Battle is an online multiplayer team-based aerial combat game (That was a mouthful). This entry was posted on Thursday, June 29th, 2006 at 7:40 pm	and is filed under CityScape Battle Dev Diary. You can follow any responses to this entry through the RSS 2.0 feed. You can leave a response, or trackback from your own site. Wonderfull! This sounds real cool. I loved your golf game as well, keep up the good work! how do you guys get money …and could i work with you ..
Hi! Looks nice. when is it finished? Just… finish it Ohh i really cant wait to play it!